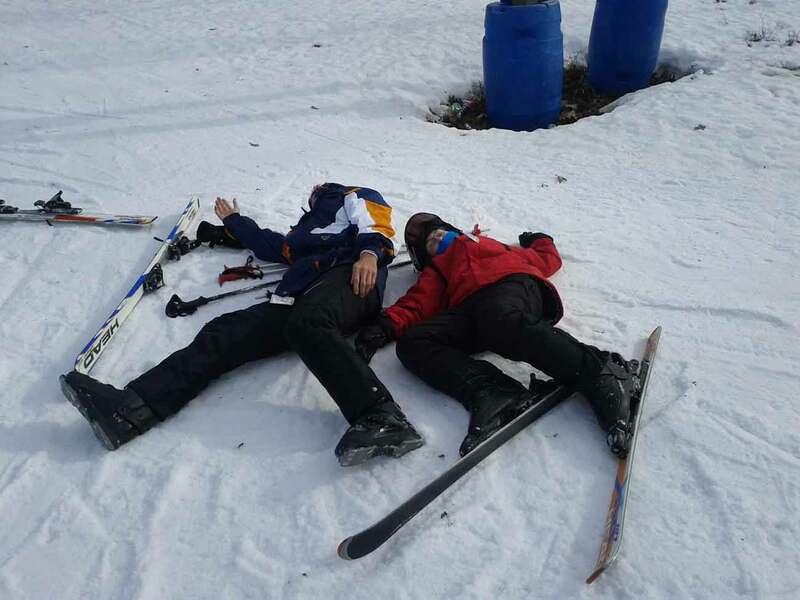 It started out as what we thought would be a fun ski trip to the Poconos. It turned out to be a $1600 ambulance trip to the hospital. Don’t worry… No one broke a leg but everyone did get a serve stomach virus. Joel, Lindzi, Russell, Lauren, Avery and Little Anthony made it back home. Nick and I had to make a pit stop at Jim Thorpe Hospital. $1600 later ( I could have taken a limo for less money) we found out Nick had a 24 hour stomach virus. On the brighter side we did manage to ski for 2 days and had a blast. This was one of many trips to the Poconos that we went on and each was memorable. We miss you buddy. VINELAND, NJ—“You are my heart” were the words that Joel and Lindzi Bermudez said to one another constantly. Losing a beloved father is hard enough on anyone. It is especially hard when the loss is suffered by an eight-year-old girl. William “Joel” Bermudez, an Air Force veteran from Vineland, died tragically last November from injuries sustained in a car accident leaving his daughter Lindzi without a father. The sudden loss has left a huge void in her life. Enter Joel and Lindzi’s friend Nickolas Casalinuovo, a 14-year-old eighth-grade student at Edgarton Christian Academy in Newfield and his “Pay It Forward Project.” The Pay It Forward Project is an eighth-grade requirement that started with the hopes of Edgarton students realizing that even a 14-year-old could make a positive difference is someone’s life. In a Pay It Forward Project, Edgarton’s principal, Dr. Mary Alimenti, presents each of the students with an envelope and encouraging words to “Pay It Forward” at a prayer service for their entire student body. Each envelope contains $40 and starts them on a journey that will change their lives. Students are challenged to think of ways to increase the money given through various fundraising activities, events or by donating their time to a cause. Nickolas dedicated his project to raise money for a trust fund for Lindzi that would help her with her future educational and financial needs. Nickolas filmed three student plays at his school and made DVDs of them to sell to the students and parents for five dollars each. He then hosted a video gaming night for fellow students with a five-dollar admission fee, all which would benefit his Pay It Forward Project. “This project has made a substantial impact in my life. Paying it forward gave me a great feeling inside. Personally, it made me happy and gave the eagerness to do more to help someone in need. The project also emits goodness to people that observe it. As once stated by Sir Isaac Newton, “For every action, there is an equal and opposite reaction.” This and the well-known cliché, “What goes around, comes around” express the truth in what happens when one gives time and effort to a good cause.” Said Nick Casalinuovo. 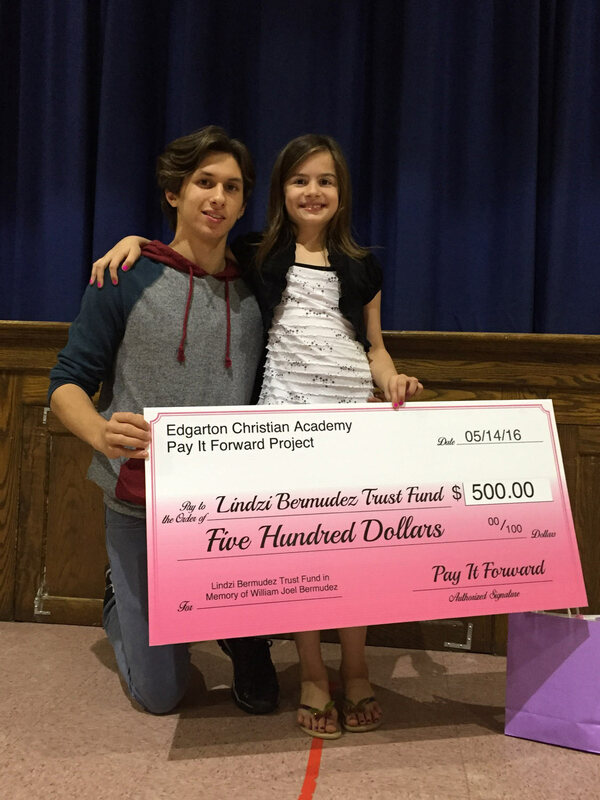 Through his dedication to the project and to his friend Lindzi, Nickolas was able to raise $500 and was honored to present a check to her at a special ceremony at Edgarton on May 14. Nickolas Casalinuovo’s noble and selfless efforts show that the motto “A friend in need is a friend indeed” still holds true. Today marks 2 years that you left us. Not only did you leave too soon, you also left something else…a huge hole in our lives that, at the time, we felt was seemingly impossible to fill. Enter your amazing daughter Lindzi. From the day we laid you to rest, (a rest you so desperately needed), your daughter has amazed us all with her maturity, kindness and love. A love so big, it fills our emptiness when we are reminded of your absence. She is something special my friend. I know you can see her and are so proud. I do not doubt that one day we will all meet again in paradise. Your love for all of us trapped here is comforting. You may be gone, but not (and never) forgotten.